Which has Stronger Influence on Society? I read several statistics that I have combined in charts. The numbers were all captured for 2012 by prominent organizations including Movieguide, the Motion Picture Association of America, Crown Ministries, Fox News and several less known organizations. Due to the disparity of the groups and the reasons behind each survey or statistical analysis, you might consider taking this article with a grain of salt, but it does ring true for me based on what I’ve seen within both the faith-based and general film industry. The studies were conducted to determine the amount of influence different types of organizations and films make on society. This is nothing new, as the impact of film on society has been studied since the early 1960s. The impact of movies on people’s purchases has been studying since the 1950s. There may have been other studies done earlier, since the motion picture industry dates back to the early 1900s, but there is little documentation available that addresses how stories influence society. When I’ve interviewed independent filmmakers, the number one reason faith-based producers make movies is to influence the culture, but they only influence like-minded people according to the latest statistics. Most general filmmakers influence both people of faith and the secular public without the intention of influencing society. However, the general filmmakers that produced with the specific intent on influencing society find their films getting minimal distribution. Patriotic films generate more gross revenue than any other film genre in the history of the American film industry. 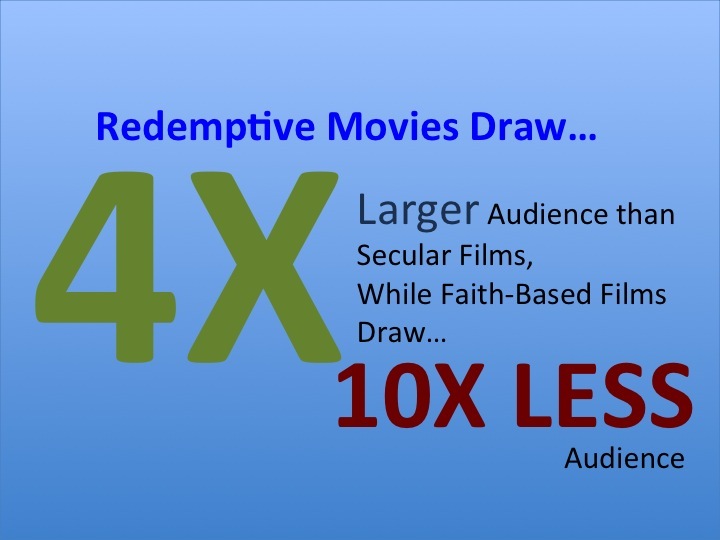 The second largest grossing films include a redemptive story and make four times more revenue than general films, while a faith-based film draws 10 times less audience than a general film. This suggests that producers who want to influence society need to make a film for the general viewing audience with a redemptive or patriotic storyline. Most patriotic films include scenes dealing with self-sacrifice for the sake of others and respectfully represent God and country. Most redemptive films include scenes dealing with sacrificial love and the redemption of common man. 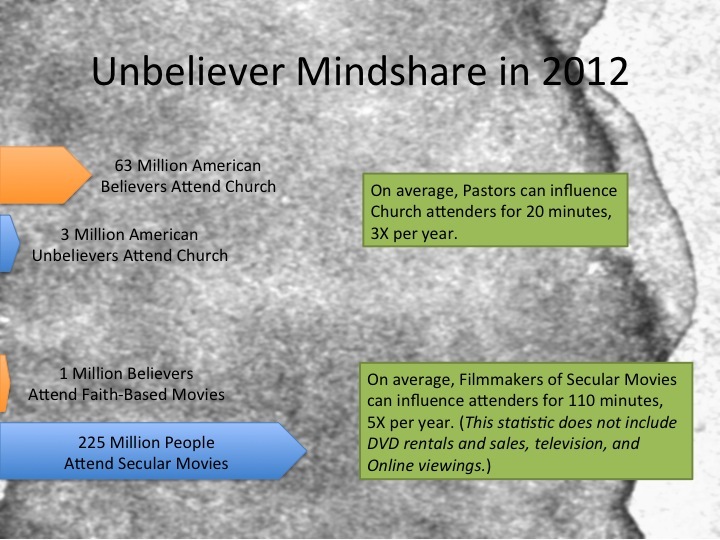 I was surprised to learn that pastors have one-tenth the amount of influence that movies have over their congregations. And, it’s even more surprising that the number of unbelievers they influence is dramatically less. These statistics suggest those with conservative Judeo-Christian worldviews need to start making more films for the general audience – Influencing them along the topics of self-sacrifice, patriotism, good work ethics, and treating others with respect. CJ, this is extremely interesting. Thanks for taking the time to assemble the charts and add some insightful commentary!